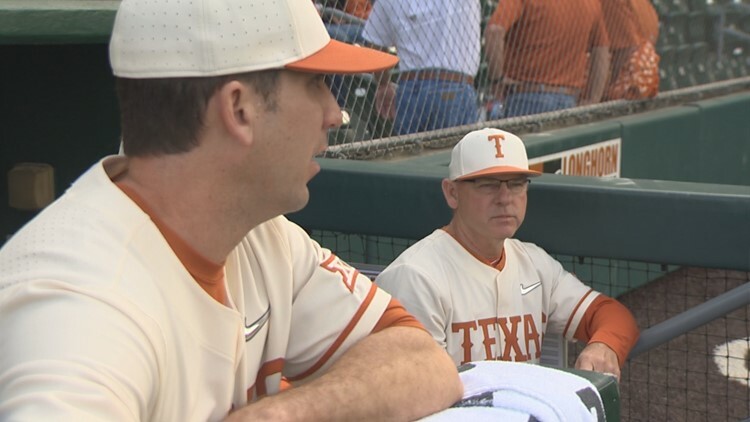 AUSTIN, Texas — Despite committing a pair of errors, it was a decent outing for the Longhorns against Lamar. Texas produced seven runs on seven hits in the 7-2 win. UT improved to 24-15 overall and will head to Stillwater, Oklahoma for a Big 12 series against Oklahoma State beginning Friday. The Parma, Italy native, Matteo Bocchi, received the nod and pitched five scoreless innings for the Longhorns. Bocchi only allowed three Lamar hits and struck out a trio of Cardinals in the win. The third inning was the decisive frame for the Longhorns. Texas plated four runs, a rally that was sparked by freshman catcher Turner Gauntt. With the bases loaded, Westlake High School product Tate Shaw smacked a double, clearing the bases, which gave the Longhorns a 4-0 lead. One of the best defensive plays took place away from the field of play. A young fan made an over-the-shoulder snag of a foul ball in the sixth inning. Cedar Ridge High School product, catcher Michael McCann, entered the game in the eighth inning and took full advantage of his one at-bat. McCann blasted a solo homer to left-center field.